Evidence of asbestos was found in two Hostess snacks that were part of a nationwide recall last month, an attorney who has filed a lawsuit against the maker of the snacks said Friday. 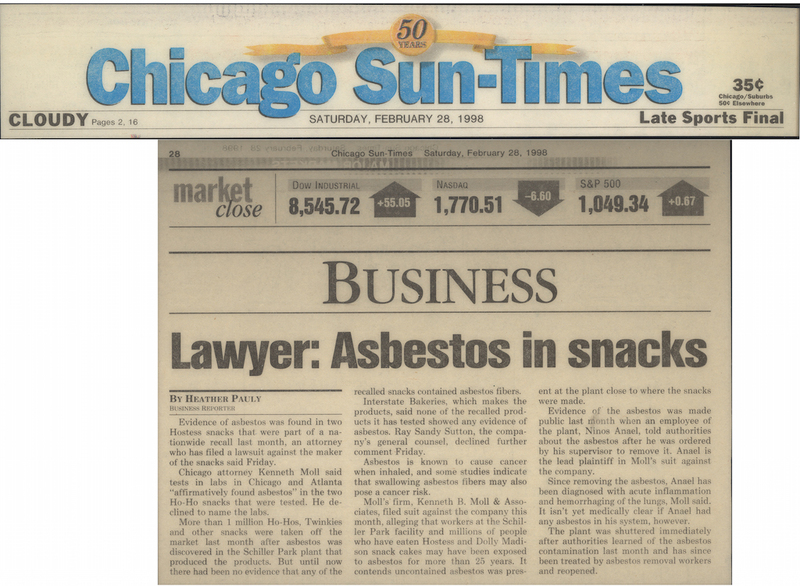 Chicago attorney Kenneth Moll said tests in labs in Chicago and Atlanta "affirmatively found asbestos" in the two Ho-Ho snacks that were tested. He declined to name the labs. More than 1 million Ho-Hos, Twinkies and other snacks were taken off the market last month after asbestos was discovered in the Schiller Park plant that produced the products. But until now there had been no evidence that any of the recalled snacks contained asbestos fibers. Interstate Bakeries, which makes the products, said none of the recalled products it has tested showed any evidence of asbestos. Ray Sandy Sutton, the company's general counsel, declined further comment Friday. Asbestos is known to cause cancer when inhaled, and some studies indicate that swallowing asbestos fibers may also pose a cancer risk. Moll's firm, Kenneth B. Moll & Associates, filed suit against the company this month, alleging that workers at the Schiller Park facility and millions of people who have eaten Hostess and Dolly Madison snack cakes may have been exposed to asbestos for more than 25 years. It contends uncontained asbestos was present at the plant close to where the snacks were made. Evidence of the asbestos was made public last month when an employee of the plant, Ninos Anael, told authorities abut the asbestos after he was ordered by his supervisor to remove it. Anael is the lead plaintiff in Moll's suit against the company. Since removing the asbestos, Anael has been diagnosed with acute inflammation and hemorrhaging of the lungs, Moll said. It isn't yet medically clear if Anael had any asbestos in his system, however. The plant was shuttered immediately after authorities learned of the asbestos contamination last month and has since been treated by asbestos removal workers and reopened.